Few days back I did a post on Chicken Tikka that I made in air-fryer without using much oil. The texture was perfect, just melt-in-the-mouth. Do you know what I have done with them? yes, I used half of them as appetizer, ate just as it is and half I made into tikka masala. And it was undoubtedly delicious. 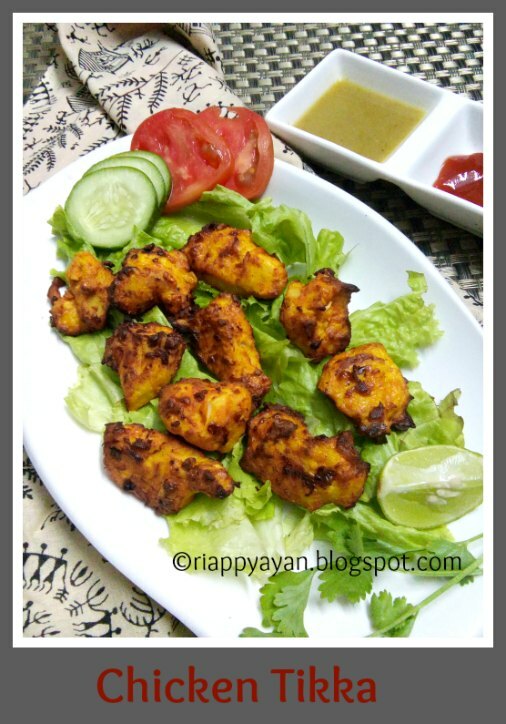 To check, how to make Chicken Tikka in Air-fryer, check here. Garam masala Powder : 1 tblps. Gram flour(besan) : 1-2 tblsp. Kasuri Methi(dried fenugreek leaves) : 1 tsp. Cumin seeds ; 1 tsp. 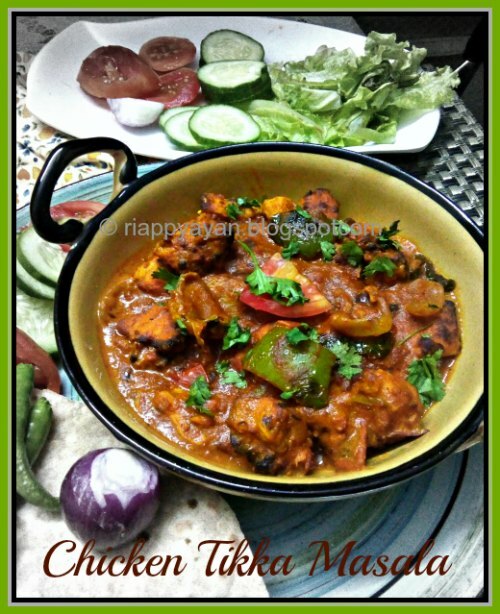 To make the tikkas, Marinate the chicken breast pieces with ingredients listed under "for Chicken Tikka" for at least 1-2 hours. 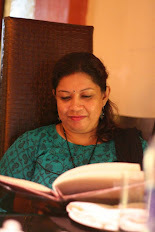 I am giving three ways to make tikkas. (a) To make the tikkas in air-fryer, you can follow the steps from here . 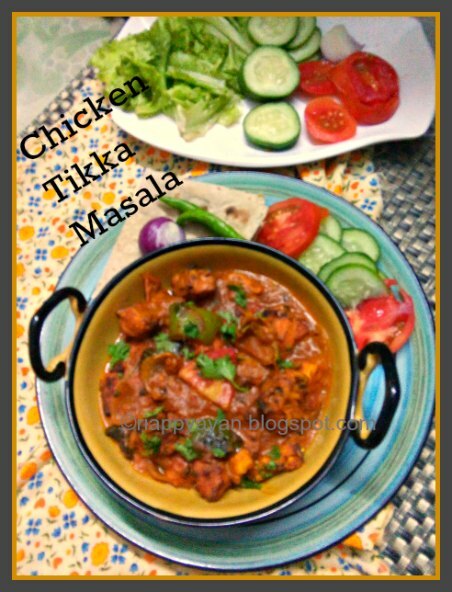 (b) You can also make the tikkas in oven. Pre-heat your oven in 200 degree C and cook for about 30 mins. on both sides or till they turn brown. 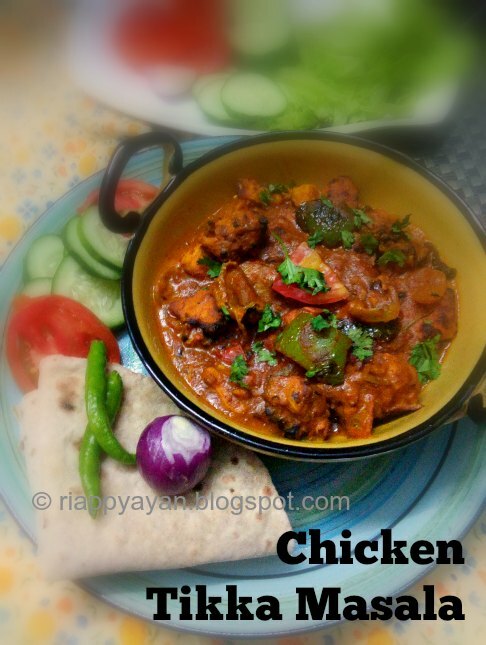 You have to add few drops of oil on all sides of the chicken while cooking in oven. (c) You can also make them on a fry pan, add 2 tblsp. oil on a pan, add the chicken pieces and cook for 3-4 minutes on high heat, then reduce heat and cook till done. To make gravy, chop 2 onions and cube the remaining 2 and separate layers. Cut green capsicums into 1 inch pieces. Cut one tomato into half, remove seeds and cut into 1 inch pieces. Grind rest of the tomatoes with green chillies. Heat 1 tblsp. oil in a pan, add cubed onion layers, capsicum and tomato pieces and saute them for 2-3 minutes and drain on a paper towel. In the same pan, add 2 more tblsp. of oil, add cumin seeds. When they begin to change the colour, add chopped onions and saute till they are brown from all sides. Add ginger-garlic-green chili paste and saute for 2 minutes. Now add freshly grounded tomato paste and continue to saute. Add coriander powder, turmeric powder, red chilli powder and salt. after sauteing this spice mix, I added 2 tblsp. of tomato ketchup for extra zing and colour. saute till oil separates. Add kasuri methi and chicken pieces and mix well with the spice mix. Add about 1 cup of hot water into the pan and in medium heat let the chicken pieces absorb the gravy. When gravy thickens, add fresh cream and sauted onions, capsicum and tomato pieces. Sprinkle some extra kasuri methi(dried fenugreek) at the end for flavour. Check the seasoning/salt. Cook for another 2-3 minutes and remove from heat. serve hot with roti, paratha, naan or any Indian flatbread. Keep raw onions and salad by the side and enjoy the deliciousness.